"The North Pole!" Ethel suggested. "The North Pole has a ferris wheel." Tom had an outdated map strewn out across his lap, searching the legend for attraction markers. "That's the only one I can think of." agreed Ariel. "There's no way The North Pole is open in May. It's all Christmas themed." Tom was trying to let go of the thought of the dead man sitting behind him. It had become a moot point, he had been outvoted on the severity of the situation. He attempted to occupy his mind with more solvable problems. "Do you think if we ask polite, Tom, that they might let us in?" Ethel posed. "We can try," he said. "I don't even know if there would be anyone there." The North Pole certainly did not look open. Situated between a major highway and a group of foothills that would be snowy at the right times, the park was partitioned off like an ancient fort. A blue, steel gate closed tightly across the length of the entrance; on it a mural of Santa Clause bade them to stop. 'SEE YOU NEXT CHRISTMAS' it insisted. To the left of the gate sat a guard post of some sort, like a toll booth, clearly designed to dispense tickets to people fortunate enough to visit the park when it was open. "There's a guy in there," Harriet pointed, "Tom, go get us tickets." Tom would have argued the increasingly unrealistic path this outing had taken, but logic was quickly becoming an insignificant factor in the day's events. Rolling slowly into the ticket-taking alcove, Tom rolled down his window to address the very confused man trying not to look up from his magazine. "Hey! Hello . . ." Tom called to him through his window. Reluctantly the man slid open the tiny glass door and stuck his head out, eyeing with interest the jagged remains of glass outlining the van's former windows. "You guys need directions?" "We're actually more interested in the ferris wheel." Harriet called. "Is no one inside?" Ariel asked. The man laughed. He was young and slightly pudgy, visibly lethargic but at the same time piqued by probably the only visitors he'd had in months. "Nope, it's just me. And I'm just here to keep the place kinda clean and stop people from getting in." "So in the entire park, there are no lines?" Ethel asked. The man smiled. "Yeah, guess not." "And there's no one here to keep an eye on you?" Harriet asked. "It's a small park, they trust me." "So what you're saying is, you're sitting in this little box, reading a magazine. And behind you, there is an entire fully functional amusement park, hidden from all authority?" The guard's name was Dave, and he had keys to everything. "I actually do this a lot," he confessed as he fiddled with a circuit breaker inside a small shack. The park was hauntingly empty. Everywhere hung hyperbolic Christmas decor; garland, tinsel, life-size wooden reindeer, a monolith Santa Clause standing atop a candy-cane-stripped slide. "The rides should be a lot easier to operate with someone on the ground working the controls." Dave flipped a switch, and the whole park lit up and began to slowly creak into motion like an aging record player. Ethel clapped her hands happily. "Dave, will there be funnel cake?" "Hell yeah there's going to be funnel cake. You think I take a spin on the carousel without a funnel cake?" Dave approached a row of vendor shops decorated like the log cabin bunkers we have been lead to believe elves live in, and began lifting their roll-top covers as the passengers dispersed and wandered into the park. Tom switched on a large fryer as Dave proceeded to retrieve some batter from a large industrial refrigerator. "So . . . what the hell are you guys doing?" "I guess just uh . . . . li-living our lives." The notion was knew to Tom, his explanations trite but honest. "Sweet, me too. Not enough people doing that." Dave scooped up a big finger-full of batter and directed it towards his mouth, conveying a look of indulgent ecstasy. "Does the batter taste good?" As the oil began to sizzle Dave dripped a small stream of the batter into it in spirals. The bubbling pool sizzled as the tan goop congealed and floated in the boiling sea of oil like mystical sea creatures surfacing for air. A couple booths down, Ben was scrapping frantically at the inside of a cotton candy machine. A blue ribbon of flossy sugar began to float like wispy sails out of it - Ben danced back and forth, catching them on a rolled paper tube, like butterflies. "What on your face, Ben?" Tom called to him. Ben pointed to his cheek with his free hand, which appeared to be blazoned with paint, and made a pawing motion with his hand. "It's a tiger!" Ariel answered, who sat at a small bench rummaging through palettes of grease paint. "You know I used to paint faces at the church carnivals. Lots of crosses and mountains. I never got to do anything so ferocious!" Ariel herself had a sort of sun drawn on her forehead, clearly created without the aid of a mirror. "What can I paint on you, Tom?" "Do the Spiderman thing." Dave suggested, crossing his face with his fingers. "Like you've got the mask on." Tom shook his head hesitantly. "That's seems little intense. I don't know if I want anything like that." "Here Tom." Ariel leaned across the counter with the palette, dabbing a makeup brush into the red paint. Beneath each of Tom's eyes she painted a single streak. "Today you are a warrior!" She continued the lines down his cheeks, to the outer sides of his eyes. "I know, this must be terribly disorienting for you. I'm sure it goes against everything you've ever done. But you're doing so well!" "I-it's happening quite naturally." Tom said, flinching from the cold paint. "I want the Spiderman if you're not going to do it." Dave insisted. "Let me finish my funnel cake first so I don't get paint all over it." Tom, Dave, Ariel, and Ben collected Harriet (who had been trying to operate a roller coaster herself), and finally Ethel, who had wheeled herself directly to the base of the Ferris wheel and had been sitting quietly ever since. "Here you are, Ethel." Ariel crouched before her, swiping a thick stroke of black grease paint with a foam-tipped brush. Delicately she applied three whiskers to each side of Ethel's face, as well as two pointed ears at the corners of her forehead. Dave began flipping switches and pressing buttons at a control panel, and music began to emanate from the platform as the wheel began to creak and turn. "Ok two at a time. Pull the bar down all the way. Ma'am, please sit down, that's not safe." Tom leaned over and lifted Ethel from her wheelchair - she couldn't possibly have weighed more than eighty pounds - and assisted her to a carriage. Setting her gently against the back of the seat, he sat down beside her and pulled the safety bar down as the ferris wheel lunged them smoothly upward. The breeze up looked like it might choke Ethel, the air so heavy against her pale, painted face, but as they slowed to a stop at the wheel's apex Tom could hear Ethel laughing. It was midday and the sun shown down upon the city and foothills like a spotlight, revealing everything evenly, leaving no shadow. The carriage rocked gently back and forth like a cradle. "You know Tom, I can't remember the last time I was on a ferris wheel. But then again, I can't remember the first time either." "You can remember times in the middle though? Some time?" "I think so," she chuckled, "you know, I feel like I'm losing a little bit more each day." "That's . . . that's too bad." "No, not really. You know Tom, there are a lot of memories I miss, like the ferris wheels and carnivals. But there's a lot of other memories that were just sitting around, talking up space. You know how they make sure we keep our rooms at the house clean? So there's not a lot of useless empty boxes and whatnot sitting around?" "Well you've got to treat your mind the same way. If there's something getting in your way, you've got to get rid of it. It doesn't matter where it came from. You know, each morning when I wake up, my room's a little cleaner. I've held on to maybe . . . one or two things, of sincere importance, but let go of everything else. Its a good thing Tom. Everyday there's a little more space for me to work with." The wheel pulled backwards, and began to spin swiftly in circles, calmly this time, gently sweeping them past the platform and back into the sky again. "May I suggest something Tom?" Ethel asked. The patterns of shadows from the ferris wheel bars danced across her face as the wind fluttered the remaining wisps of her white-blue hair. "When you wake up tomorrow, do so in an empty room." 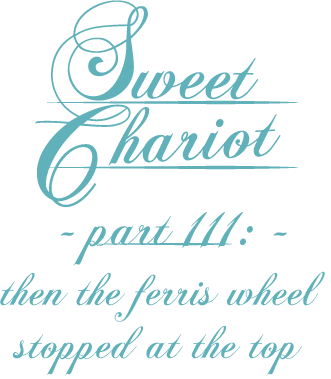 The Ferris wheel slowed to a stop, and when Ethel reached the bottom, she lay lifelessly against the back of the carriage, a look of peace across her face. Gently Tom lifted her from the seat and placed her back in her wheelchair. Dave didn't notice as he let the other passengers off one by one, back onto the platform. He stood idly scratching red paint from the inside of his ear. "Ok guys, we have to go." Tom announced. He motioned discretely to Harriet by shaking Ethel's chair lightly back and forth. Harriet exited the platform and hobbled down thin metal stairs as quickly as she could. "Alright everyone," she chimed in, "Back to the van . . ."
"You guys leaving?" Dave asked, setting his funnel cake down on the control panel. "I'm just getting warmed up!" "Sorry Dave, we have a busy day. I hope you understand." "Definitely. Life doesn't slow down for anyone." Helping the last passenger out of the cart, he sat down in an empty cart, and struck the power lever with his foot. "You guys come back any time." "We will!" Ariel yelled after him as they darted through the tiny snow village, back to the bus. In heaven, Ethel realized she was standing. The nightgown that she had been wearing had been replaced by the sun dress she hadn't seen in twenty years. Ahead of her was a crazy bustle of voices, shouting. Soothsayers attempted to calm the situation, while others lied on their stomachs, pushing their faces through the clouds. "Well isn't this lively." Ethel said aloud. For the first time in a while she knew she was making a pun. Gregory ran up to her, explaining things in a quick but more practiced manner. Helen and Victor stood by, exchanging sly smiles with Ethel over the boy's exuberance. "Well I hope I'm not the cause of all this fuss." Ethel wandered into the crowd of people where the heated argument was centered. "And I'm saying you should be quiet!" the angry man boomed at a group of teenagers. Behind him stood other men and women, nodding in agreement to his words. "You're being completely impolite by talking aloud in front of others like this." "Who?" one asked, "Stacie, Eric, or Ryan?" "I am NOT calling you by the silly names you've made up, and I'm not - "
"Bradley," Ethel asked the man, "Bradley, is that you?" The man paused mid-sentence, turning to look at Ethel. "Oh Bradley! Oh - If I told you just how many people told me to let you go." Ethel grabbed the man by his hand, her eyes watering, she lifted his arm behind her back to embrace him fully, "If you knew just how close I was to doing so, but I never did. Of all things, I never forgot you Bradley."